Open boat and charter dive trips daily and weekly! Service to all of the Northern Channel Islands! Safe, experienced and friendly environment! Custom dive boat built for short or long range diving! 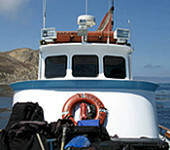 Best boat diving in California!